PHILADELPHIA – The helicopter was ready, prepped to fly through the night sky from Philadelphia to New York City to get the man who scored more touchdowns than anyone who has ever played Division I college football to where few thought he’d end up: the Heisman Trophy ceremony. What a site it would have been, as the fans lining the red carpet would have gazed upward. It’s a bird? Nope. It’s a plane? Not really. It’s Superman? Well, Navy senior quarterback Keenan Reynolds isn’t a superhero in the traditional sense, but when he ditches his Naval Academy dress uniform for shoulder pads and a helmet, he’s more than human. Reynolds, at 5-foot-11 and 205 pounds, certainly is strong. He’s rushed for a career 4,415 yards – the third-most in major college football by a quarterback not named Denard Robinson (4,495) or Pat White (4,480) – and is the only Midshipman to have rushed and passed for at least 1,000 yards in a season twice. But he isn’t strong enough, at least in the eyes of Heisman Trophy voters, to lift college football’s most prestigious award, which was won by Alabama running back Derrick Henry last night. 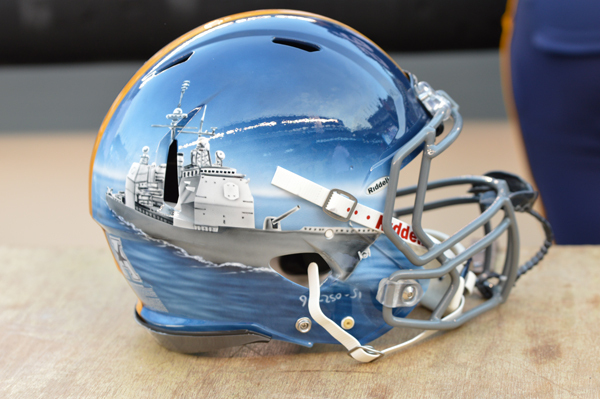 Navy debuted seven different helmets – each on hand painted – that were worn by the Midshipmen against Army. Reynolds scripted the next-to-last chapter of his record-setting career by rushing for 136 yards and two touchdowns on 21 carries to lead his No. 21 Midshipmen to a 21-17 win over Army (2-10) in the 116th meeting of America’s Game at Lincoln Financial Field. His 85 touchdowns (all rushing) for his career are two more than former Wisconsin running back Montee Ball and Louisiana Tech’s Kenneth Dixon, who has a bowl game left in his career. 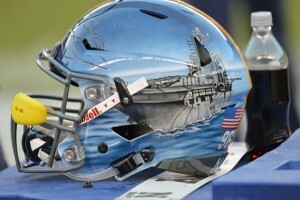 Keenan Reynolds, as well as the rest of Navy’s quarterbacks, wore a helmet with an aircraft carrier because the vessel because it’s “the quarterback of the Naval fleet, the aircraft carrier is the ultimate decision maker; the ‘quick strike’ weapon of the Naval fleet,” according to the Navy. And so does Reynolds. 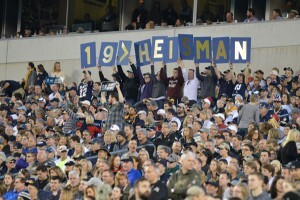 At the Military Bowl against Pittsburgh on Dec. 28 at Navy Marine Corps Memorial Stadium, he’ll have opportunity to do what no Midshipmen quarterback, including Hall of Famer Roger Staubach, has done: lead Navy to a school-record 11th win this season, breaking the mark set in 1905, 2004 and 2009. Though Reynolds didn’t join Staubach (1963) and Joe Bellino (1960) as the Academy’s Heisman Trophy winners on Saturday, he became the first quarterback in the history of the Army-Navy game to go 4-0 as a starter. Reynolds, however, doesn’t need a 25-pound bronze trophy of a ball carrier to validate his greatness on the football field. He’ll just let others do it for him. “He’s a leader by example and he’s always working to make himself better and the team better,” said junior safety Daiquan Thomasson. But to understand why Reynolds wears a perpetual ear-to-ear grin, it’s because his master plan has opened a hole for his future as big as ones created by Navy’s offensive line on Saturday. Growing up in Antioch, Tenn., Reynolds had the opportunity to play quarterback after graduating from Goodpasture Christian School at three colleges – Air Force, Wofford and Navy. “He was this close to having a lightning bolt on his helmet,” Niumatalolo said, referring to Air Force’s uniform. Reynolds chose Annapolis – and not because of the Midshipmen’s superiority on the football field. Reynolds thought Navy positioned him best to where he wanted to be in his 40s, not his 20s. He knows what the future holds – and it’s not on the football field, at least not in the next few years. Like all Midshipmen, Reynolds is obligated to serve in the Navy for five years unless he receives a special waiver, so first he’ll be pursuing a military career instead of the Lombardi Trophy. To prepare for his post-graduation assignment as an officer in information warfare, which involves managing information and communication technology to gain an advantage over the enemy, Reynolds is taking national security decision-making in the cyber age, politics of irregular warfare and political philosophy. But he’s also taking financial analysis, sports economics and of all classes, tennis, because all Midshipmen have a physical-education requirement, even ones whose athletic exploits appear on SportsCenter. Though Navy’s fans are fretting Dec. 28 – the day of Reynolds’ final game – Army’s faithful can’t wait for it to come soon enough. Reynolds was again masterful against the Black Knights from West Point. In four games against Army, Reynolds has rushed for 415 yards and seven touchdowns on 92 carries and has thrown for 430 yards and another score and no interceptions, as Navy has outscored the Black Knights 89-47. His seven touchdowns in the Army-Navy game are unmatched. Two of Reynolds’ wins over Army were decided by seven points or fewer, and this one was just as close. 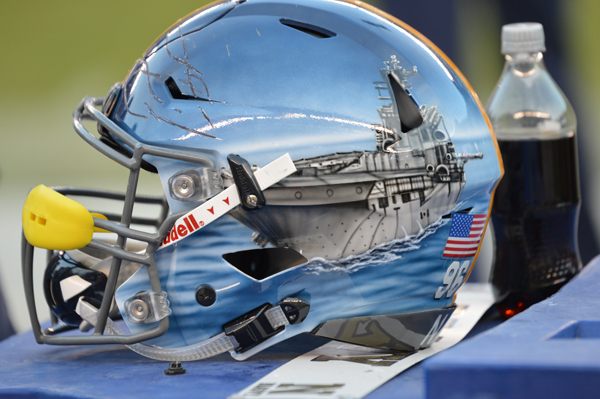 Trailing 3-0, Navy needed two plays to take the lead. Reynolds followed a 17-yard run with a 58-yard burst up the middle. He raced, untouched, through the middle and into the end zone, where he bowed to the Midshipmen fans cheering his record score. 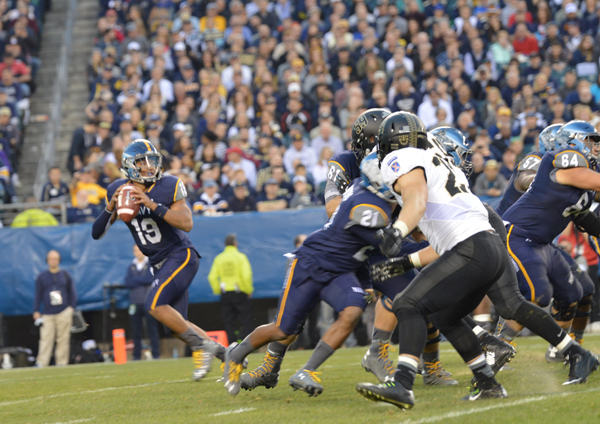 Keenan Reynolds is the only quarterback to go 4-0 as a starter in the Army-Navy game. 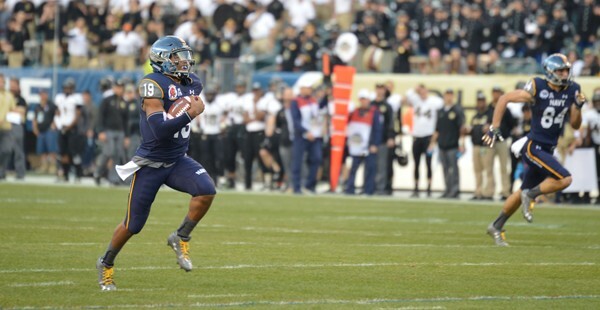 After Army took a 10-7 lead on its next series, Navy countered when Reynolds capped a seven-play, 50-yard drive with a 1-yard scoring run he set up with a 35-yard scamper three plays earlier. Army, a 22-point underdog, didn’t go away. The Black Knights took a 17-14 lead at halftime following Tyler Campbell’s 29-yard run with a little over four minutes left in the second quarter. The last time Army scored more than 14 points in the first half against Navy was in 2001, the last time it defeated the Midshipmen. But that was against a winless Navy team, not one that’s been ranked for five straight weeks. The Midshipmen took the lead for good when Reynolds found Jamir Tillman streaking across the field for a 50-yard touchdown less than six minutes into the third quarter. Navy then let Army, be, well, Army. The Black Knights drove the length of the field and appeared poised to score – until quarterback Chris Carter took a sack instead of throwing the ball away and Daniel Grochowski pushed a 29-yard field goal wide left with 12:19 remaining. Army got the ball back and fumbled twice in three plays, losing the second one. And that was just the start of the turnover circus in the final quarter. After the Black Knights got the ball back on their 20-yard line with 3:36 remaining, Carter missed a receiver running wide open down the middle of the field and instead flung the ball into the arms Navy senior safety Lorentez Barbour. With two minutes remaining and after Army had moved inside Navy territory, Carter threw a screen to receiver DeAndre Bell, who lobbed a pass to a receiver near the goal line. However, Bell’s fling – and the Black Knights’ final chance to win – fell into the hands of Thomasson at the 2-yard line with 2:03 remaining.